You might be interested, Laurie, that Leonardo de Pisa (Fibonacci) used the lattice method. He and others were also using the vertical algorithm. After some time he abandoned the lattice method because it was less efficient and did not support understanding very well. Fuzzies love to show this as "a different algorithm" even though you can easily map each of its steps to that of the standard algorithm. It is a different bookkeeping method, that's all. 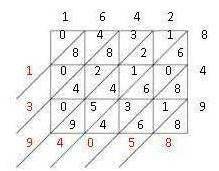 Next time a fuzzy shows this to you as if it were the most modern innovation ever, remind them of this history and then challenge them to explain why it works and what THIS number (in the middle of the lattice represents (ie show understanding) and what role it is playing in the algorithm. It's silly for people to point to reform methods as being valuable because they were done a long time ago. Many things were done a long time ago -- horses and carriages, wringer washers, surgery without anesthesia, 8-track tapes ... We don't do things that way now because we have something that's more efficient and more effective. 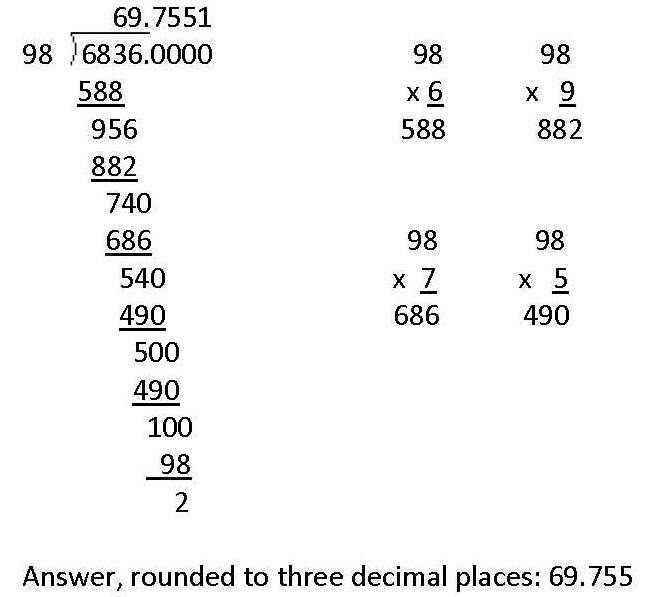 It's also true that place value is not as obvious in the Lattice Method as in the vertical method. Along similar lines I like to suggest that because it is so tiresome for students to draw all those rectangles, squares and cubes for doing "Pictorial" arithmetic, why don't we improve it by making simpler symbols for 1, 10, 100 and 1000 that don't tax the artistic skill or take up so much space on the page. Then we can perform these same manipulations with accuracy and much more efficiently than with the pictures -- a great improvement. Wait a minute! I hear some "reformers" saying. This is just doing arithmetic with Roman Numerals. I agree, except that if you're paying attention it is a bit more crude than Roman Numerals. Sort of "Roman Lite". Then I congratulate them for setting back the art of arithmetic by over 2000 years. John Bolton was being interviewed on TV this a.m. about the political mishandling of the Libyan tragedy. He said that ideology blinds individuals to reality and that it is more dangerous than any actual coverup. Ideologists simply will not accept that their beliefs are wrong and often disastrous. It made me think of our education system and how dangerous the leaders are, not only for our children but for our country. I find it all very scary. Dabbling in "constructed reality" IS dangerous whether you are in Diplomatic Corps and at the mercy of an ideologist President. Or, if you happen to be passenger on a new airplane designed, built and flown by past students from "constructivist math" era classrooms. Sorry combinations, both examples. In case someone hasn't seen it: M. J. McDermott's video "An Inconvenient Truth" remains the best expose of this fraud. On YouTube. Now, I dispute this: "The failure of reform is obvious to all except the reformers..."
Precisely because the failure is so obvious, I've concluded that the reformers must see it, and therefore must want it. They designed Reform Math so kids would not learn math. It's an exact parallel with Whole Word, which guarantees that children will not learn to read. Out here in Greenwich CT, we have been fighting to get rid of Everyday Math for the last year and one-half. As part of this effort, I have become familiar with the Teacher's Manual. One of EDM's favorite tools is the Lattice Method. I wrote a blog post disputing EDM's contention that the Lattice Method is efficient. Enjoy. Brian, your link might be in editing mode. I don't have access to see it. Would you mind sending a different link for the article? Just as a note, the Common Core does not mandate the adoption of student centered instruction. In fact, the last version I read of the the Common Core actually pointed out that it was not to suggest one method of instruction over another but to give guidelines on what material should be covered. It would work to teach the material directly as well. So blaming it for the methods used is probably a stretch logically. In some areas, the Common Core is stronger than what was in place. In subjects such as trigonometry, Washington had no real guidelines for educators which meant departments teaching various topics for reasons as frustrating as "Our teachers know this topic better than that one so we include it over the other". In that sense, it could be useful to, in theory, make schools cover important concepts. In some sense, the ideas of student centered education could be useful as well. For example, students working together on a long, difficult project can be incorporated successfully into direct instruction curricula. However, I do agree that it has been taken to an unhealthy extreme. One idea about the reason for that which I want to toss out there is that it requires less knowledge to teach advanced math in this manner. In many districts, including SPS, teachers without much experience in math are being forced to teach it. Saying "Here is a worksheet, work together on it to derive the Pythagorean Formula" is easier than acquiring the knowledge to effectively teach it and be able to answer any number of student questions about it as well. Re: "Precisely because the failure is so obvious, I've concluded that the reformers must see it, and therefore must want it. They designed Reform Math so kids would not learn math." Exactly. Reformers send their own children to private schools that teach the traditional algorithms. I have a PhD in an STEM field from a top-10 university and have also taught high school, though admittedly I have not taught elementary school, nor do I have children. I stumbled upon this post after learning about the lattice method the other day. There are many things wrong with how math is taught in school these days, foremost the permissive use of calculators. But these two multiplication methods are not among the wrong things. Nor are they better than the vertical method. It depends on the student and the situation and, most of all, how well the methods are taught and explained. Though this may not be your intention, you come across as opposing the methods because they are "reform" methods without actually understanding them or thinking about how they might have some advantages over the vertical method. You also seem to confound your opposition to calculators, which I share, with your opposition to unfamiliar methods. You write, "Clusters also can be done after factoring the multipliers, but I doubt reformers would use the Cluster Method to solve problems containing this many digits. They would recommend using a calculator. The entity doing the calculating, in that case, would be the calculator and not the student. Little actual learning or practicing would take place." If calculator use is so freely permitted, why would it matter whether they were doing it the vertical way or the cluster way? The cluster method is the best way to do mental math. It's cumbersome when you have two huge numbers like 1642x849, but it works better than the vertical method if you want to mentally multiply two manageable numbers like, say, 122x33. The cluster way is disadvantageous in that it's cumbersome to write out. It's advantageous in that it teaches the distributive property of multiplication better than the vertical method. As for the lattice method, whether drawing the grids causes more or fewer mistakes is debatable. Using the vertical method, I've certainly made my share of mistakes by putting something in the wrong column. I'm still prone to doing that, so I've decided to adopt the lattice method going forth if more than three digits are involved. Though I haven't seen it presented in this context, I worked out some quadratic problems with the lattice method and find that it's easier than the method I was taught (and probably you were taught too). Expanding something like (a+b)^2 is easier with the lattice method. As for decimal places, it's simple. In the cluster method, it's a non-issue because you've already broken it down into tenths, hundredths, etc. In the lattice method, just count how many digits there are to the right of the decimal place, and adjust accordingly. Your example shows that 1642 x 849=1394058. Suppose instead that it were 1.642 x 8.49. 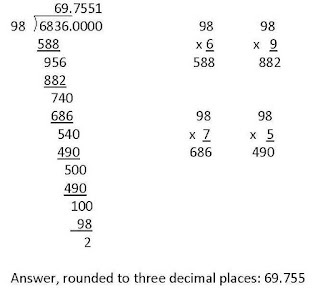 There are a total of five digits to the right of the decimal place, so make your answer have five digits to the right of the decimal point (13.94058). Visually, in the lattice, this would be the intersection of the two lines. It's hard for me to describe that in words, sorry. Here's another method for multiplying two multi-digit numbers. I present it not because I think it should be taught as the primary way to solve multiplication, but rather to demonstrate that there are many ways to multiply, but they are all based on partial products and the distributive property. By the way, what would you think about teaching the soroban method? Japanese kids learn it in elementary schools. On the one hand, I oppose calculators, and the soroban is kind of like a calculator. It also takes considerable time to learn and should not be taught as the only multiplication method. On the other hand, it's a great skill you can use anytime because it can be modified to the fingers or to mental imagery, and it allows you to do complicated calculations quickly. I suspect that "anti-reform" people (of which I am neither a member nor a non-member) would mostly have a kneejerk opposition to teaching this method because it looks weird. Thank you for your comments, MM. I'm not opposed to certain methods out of habit or because they're unfamiliar. c) don't work effectively for the long-term (such as division methods that must be abandoned when doing more complex problems). The lattice method is complex for children to draw, and it isn't sustainable for the long term. It is not the best way to do things. As a tutor, I accept that every child is different and requires different instruction. My hat goes off to teachers who can manage classes of 25-30 students. What a challenge. I admire those who do it well, in spite of all that they face. However, the goal should always be to get children doing the math in the most efficient, most accurate, and most long-term-useful manner possible. I'm not opposed to calculators, but they should be used judiciously, and almost never in any math level below Algebra. I like the abacus. I own one that has been in my family since I was a child. It can be used to teach certain concepts behind the math, but that can also be done in other ways that are more useful. Teaching math isn't about the teacher. It isn't about you or me or the superintendent, the board, Bill Gates or Arne Duncan. It's about the student, and what the student will be able to use later in life, after he or she leaves the classroom. The tools provided to the student should always be the best tools available. Math doesn't have to be constantly reinvented. It just has to be taught, learned, practiced, and then used. That's all there is to it. Many public schools, colleges of education and administrators don't see it that way. That's why we have the national math problem that we do.